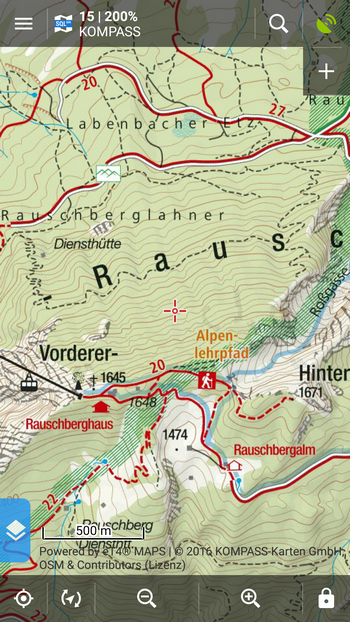 Some time ago in a new version of Locus we introduced a complete portfolio of outdoor maps of the German-Austrian cartography publishing house Kompass. For Locus, this event was one of the most important milestones, meaning connection of the latest mobile orientation technology and quality map data of a renowned traditional producer. 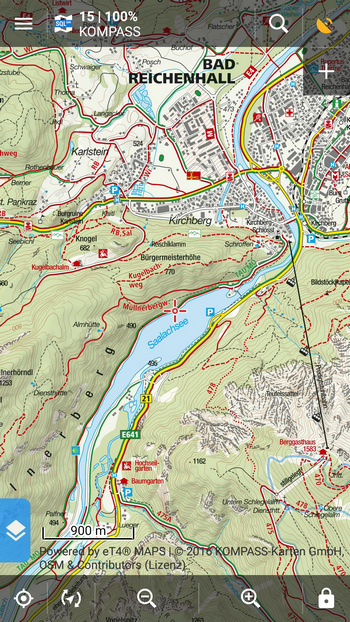 The first hiking map sold under the trademark Kompass was issued by Heinz Fleischmann, an engineer from Munich, in 1953. It covered area of Berchtesgaden – Bad Reichenhall, was drawn in detailed 1:50 000 scale and contained a decent amount of useful information for hiking and mountaineering, ski route tips, pubs, shelters and other facts. At that time it was a great success and meant a humble start of one of the biggest cartographic publishing houses in Europe. Only after seven years Kompass founded a branch in Innsbruck (AT) and presented 33 outdoor titles. The house gradually became an acquisition of the company Mairs Geografischer Verlag and its headquarters moved to Innsbruck in Tirol. 2003 meant the beginning of digitization and Kompass for the first time issued maps on a CD, fully optimized for GPS use. Since 2009 it produces also cycling maps and until now the total of their outdoor maps amounts to more than 700 titles, covering areas from northern Denmark to Canary islands. What are Kompass maps like? They are significantly very clearly drawn, with splendid readability and unprecedented accuracy. Locus provides them in 4 zooms that can be of course freely resized – 10, 12, 14 a 15. Besides the background topographic layer the maps contain hiking paths of various difficulty (marked by full, dashed and dotted line), both local and transit cycling routes, symbols of tourist facilities (huts, pubs, hotels, shelters etc…), natural, cultural and technical points of interest. Terrain is defined by contour lines in 20m equidistance and also by shading. How can I get Kompass maps? All Kompass maps are available in Locus Store (Menu > Locus Store > Providers > Kompass). They are sorted by countries within which they are offered as ready-made packages or you can define a custom map crop. Prices vary according to the package (covered area) size, the free selection is offered for 9 LoCoins per 100 map tiles. Kompass maps can be found in Germany, Austria, Belgium, Denmark, Czech republic, France, Hungary, Italy, Luxembourg, Netherlands, Poland, Portugal, Slovenia, Spain and Switzerland. We wish you a lot of pleasure on your journeys with Kompass maps!